Winner of over 90 international awards, including 23 for Best Musical, Matilda The Musical has been seen by more than 9 million people worldwide. Cambridge Theatre on Sunday, 9th June 2019 at 3pm. The performance provides a relaxed environment for everyone with elements of the production adapted to reduce anxiety or stress and with lighting and sound levels adjusted to soften their impact. Audience etiquette throughout the whole theatre is relaxed with all audience members given the freedom to make noise and/or move about the auditorium according to their needs without restriction. Designated ‘chill-out’ areas are provided outside the auditorium with soft seating and activities available for people to use if they want to take a break. All theatre staff, crew and company members receive specialist training in advance to support a wider range of audience needs. Once you’ve booked tickets, a visual story will be emailed to you to help familiarise you with the plot, characters and the setting before arrival at the theatre. Detailed event and transport information is also available here. Thank you to all who attended the Family disco at Wellingborough on Friday 22 March. We raised a fantastic £144 towards improvements to KS1 Playground. Last Tuesday (05 March) a group of pupils went to Isebrook school to compete in a Tri Golf Festival. There were lots of different stations set up and all children had the opportunity to practice their putting and chipping skills to then try and score as many points as possible. There were 7 schools competing and Rowan Gate were the only primary school, all of the other participants were older… but despite that we came 3rd out of 7 schools which was fantastic!! The children had lots of fun and were all amazing!! Well done!!! On Wednesday (13 March) the Sports Crew went to Raunds Manor Sports College to take part in the Step into Sport Celebration Day. The pupils who are part of the Rowan Gate Sports Crew help during lunchtime clubs and are able to lead a small warm up! They are all fantastic role models in PE and are able to help during demonstrations, help other children to learn a new skills and are great sports leaders! They all have a pink leaders top so we know who they are! At the Step into Sport Camp we met Jade Whindley who was a Tennis Player and was British Junior Number 1! She showed us lots of different games we could play. Then the children made up our their own warm up game and showed it to the other schools… the children were so confident they even volunteered to go first!!! Rowan Gate was the only primary school at the camp but that really didn’t matter. The children put up their hands and answered lots of questions. They were fantastic young leaders! All of the children were amazing and received a certificate. ‘Shinning Star Awards’ were also awarded to children who Jade thought were extra great leaders. The children were fantastic, confident, knowledgeable and shared lots of their ideas with the other young leaders! Well done, we are very proud of you. Keep being great young leaders!! Friends would like to invite our families to a Family Disco to be held at Wellingborough site on Friday 22 March 2019, 6 – 7.30 pm. Friday 15th March is Red Nose Day. Pupils and staff are invited to “wear it red” for a voluntary contribution of £1.00. In the UK Red Nose Day helps to give shelter to young people living on the street and in Africa helps to save thousands of people from malaria and provides whole communities with fresh water and life-saving vaccines. I’m running a marathon!! I did one a couple of years ago and vowed never ever to run that far ever again!! However, it would appear that I managed to sign up again this year and will be running Brighton Marathon on 14 April. But why? Well I am running to raise money for Prostate Cancer UK- a charity very close to my heart who have provided invaluable support and advice to my step-dad who is currently undergoing treatment for aggressive prostate cancer. PCUK receive no government funding and yet Prostate Cancer affects thousands of men from all walks of life. Most of us will undoubtedly know someone who is currently diagnosed or has been diagnosed with this disease. Running is something that I love to do, and fitting in the training for a marathon is hard work. But any inconvenience that I experience is minor compared to the journey that my step-dad and countless others are enduring. 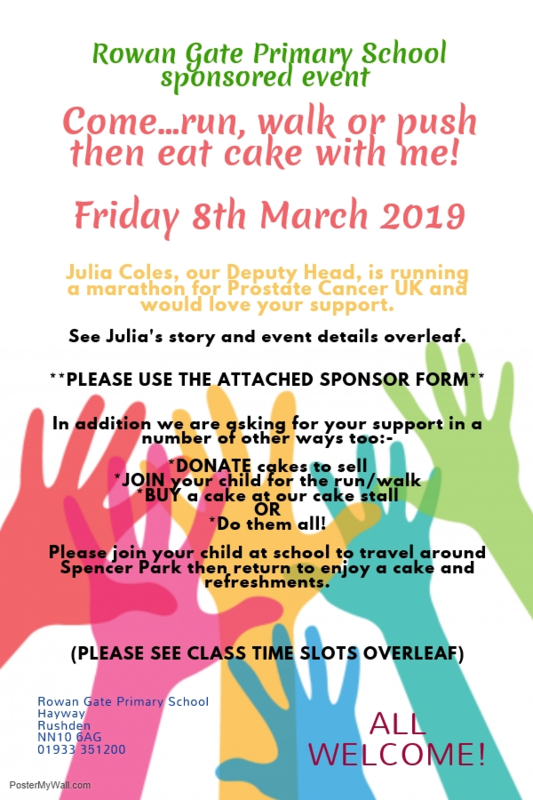 I would love it if you could join me on Friday 8th March for a sponsored run (or walk or push) around Spencer Park, Rushden. I will be running around the park 26 times and have invited classes to join me for blocks of time to keep me company! I know they would love to be joined by mums, dads and carers. Afterwards there will be a Cake Stall in the school hall so that you can replenish your energy. 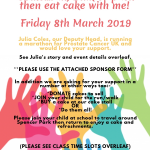 All money raised either through sponsorship of your child, by purchasing cakes or as a donation to my fundraising bucket will go direct to Prostate Cancer UK and will, I know, be received with much thanks. 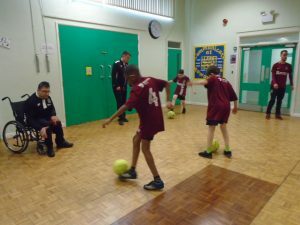 Various pupils at the Wellingborough site have taking part in an after school football club on Mondays for the past 15 weeks. 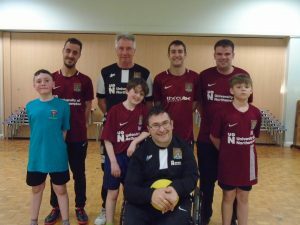 The club has been run by Miss Green (PE Lead) with the valued help of volunteer staff from Northampton Town Football Club/Football in the Community. Many thanks to Russell Lewis, Martin Nelson, Mustafa ElBayati and Matthew Sellars. Each child was given a football shirt and programme as a memento of taking part. Here are some photographs of some of the children who have taken part. It was lovely to welcome the children back into school yesterday. We hope you have had a pleasant break.